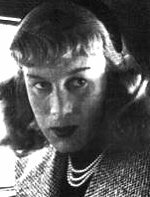 On May 15th, 1951 Robert Cowell became Roberta Cowell the United Kingdom’s first full surgically altered transsexual. This occurred almost 2 years earlier than Christine Jorgensen in the USA. Born on May 21st, 1921, in Croydon, Robert Cowell was the son of famous surgeon who was also an artist, sculptor, writer, lecturer, naturalist and a good violinist; his mother was strongly religious, a social worker, a fine pianist and a would-be singer. He had an older sister and a younger brother. His early instincts were strongly heterosexual – he could not abide much physical contact with other males. He loved tennis and fencing, but overcame his prejudices to play in the school rugger XV as a wing three-quarter, despite his comparatively slight build. 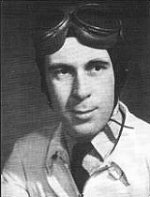 He left school at 16, and got a job at the General Aircraft Co, at Hanworth, which he saw as good engineering training for a strong interest in motor racing. He joined the RASC to get a flying commission through the ranks (the second time of trying to be a pilot) which he achieved in ’41. In May of that same year, Robert married a girl he had known for some years, and very soon they started a family. Robert was determined to become an airman, however, and was eventually (with the urgent British need for pilots) accepted for flying training. He became a Spitfire pilot. After a number of wartime flying adventures, Robert was shot down by flak over the Rhine, a crash from which he was lucky to escape. But he became a prisoner of war, ending up in Stalag Luft 1, near Lubeck in N.Germany. The Russians came on May 5th, 1945, and Robert was repatriated to the UK shortly after. After the war, Robert was faced with earning a living, having a wife and two children to support. With a business partner and a couple of helpers he set up a specialist auto engineering company. His thrill of speed and the re-starting of motor racing in ’46 encouraged him to enter events in as many different cars as he could and with this experience to design and build his own (BRM influenced) racing cars. But things were far from well in his personal life. Because of frequent absence during the War and his lost years as a prisoner, his marriage had become acrimonious and unsatisfactory, and ended in divorce. He became unwell, depressed, and moody because of this. He was not a big man to start with, and lost a lot more weight. Seeking help, he went to three psychiatrists, the last being a dour, patient but understanding Scot, who finally proved to Robert that he was repressing his feminine side, and that the ‘woman’ in him was very deep-rooted. The reverse of what Robert had expected – he reckoned he had a complex fear of losing his masculinity! Perhaps they were both right? Robert gave himself a year to try to sort his life out. One day, after a squash match, his opponent observed “You know, you really ought to wear a brassiere!” This jokey comment actually caused Robert to try to find out just how much of a female he really was! A few days later he consulted a famous Harley Street sexologist. The sexologist’s considered opinion … Robert had quite prominent female characteristics! He opined that, in Robert’s case, his latent feminine characteristics were late developing. He thought that a degree of hermaphroditism was present too. Further medical examination would be needed to see how feminine Robert was inside his body. Robert did not wish to become someone of no particular gender, or appear as an effeminate male. The problem was to re-orientate his existence to include his newfound femininity without becoming a social outcast. Shortly after, a brilliant woman doctor, a gland specialist, took on his case. She had Robert examined by two gynaecologists, two GPs, a professor of anatomy and an endocrinologist. Their conclusion – they were amazed not that Robert was so feminine, but that such a female person could seem outwardly so masculine! They discovered an abnormal flow of female hormones in his body. Robert had two options, the doctors suggested. To carry on unsatisfactorily as he was, or to live the rest of his life as a woman if he cared to chose to do so. Robert eventually discounted his personal third option – to end his own life. So Robert accepted that nature had originally intended him to be female. It explained his mental and physical contradictions, and allowed him to believe his depression had a physical reason; he was thus able to rationalise his situation to a greater degree. Although none of the doctors had personal knowledge of gender change from male to female, they had (apparently) often come across the female to male gender changes before, and had assisted such changes! They suggested that the use of female hormones, breast enhancement surgery, a face-lift and a genital operation could remove any sexual ambiguity. He finally made his big decision – to plan the change to womanhood and go for it! He just hoped the strain of keeping the secret until his ‘big day’ would not be too great, especially as the hormones began to ‘womanise’ him. Robert would have to fund his own operations, as the necessary specialists were not in the then fledgling NHS. The hormones alone were extremely expensive! So Robert started out on his great adventure – to become Roberta. Roberta Cowell Movie View Movie 2.10mb (to view download Real Alternative Video Player Free). The best female hormones that were then available. Firstly his brilliant woman doctor put on the best female hormones that were then available. In only a few weeks he noticed the first result – he acquired a more delicate complexion! His skin became much smoother, almost childlike. On more than one occasion he was mistaken for his younger brother! Greatly cheered by this, he also noted he was losing muscularity too. Soon his head hair thickened whilst his facial and body hair thinned even more. The treatments were to go on for nearly two years. They did not all go smoothly, and the effects varied; some days, Robert was quivering with excitement and pleasure at his growing femininity; on others he barely had the energy to wind his watch. On one occasion he got spots before the eyes. And twice he had attacks of amnesia. His left-handed writing changed to the point where the bank manager thought they were getting cheques with forged signatures! He had to go on a strict diet because a more feminine fat distribution started making him look tubby. His mental processes changed and slowed, although he found they were replaced by new powers of intuition. He also began training himself to pitch his voice a little higher, and to cut out the armed services tutored swearing. After two years of an increasingly intersex existence, Robert came face to face with the final independent consultant. Concluding the results of another thorough examination, he pronounced Robert “..not a man. Most definitely a woman”. As Robert finished dressing after this examination, he at last fully realised that he would soon be a she – and would in short order be out of trousers and into skirts and dresses. It was the early 1950’s, when it was possible to take immediate legal steps to re-register her birth gender. Affidavits were sworn, and a revised birth certificate was quickly issued. Robert became Roberta legally 50 years ago, on May 15th, 1951 … despite the fact he was still living mostly as a male! This caused her quite a few day to day problems, but finally the surgeons agreed to complete the gender change operations later that year. It was to be the first in England of its type. In preparation Roberta began wearing women’s clothes outside of work time. He/she moved in with a close friend, confidante and supporter named Lisa. Roberta’s early experiments with feminine clothes and cosmetics showed her just how much she had yet to learn about womanhood. Towards the end of ’51 the first operation was scheduled. Almost unbelievably, as we see it today, it was to be Roberta’s first long-term venture out as a female. After her last restless night in hospital as a semi-male, she was given the UK’s first pioneering vaginal construction operation. It took nearly seven hours, but was pronounced a great success! This naturally made a great difference to Roberta psychologically. The results seemed comparatively painless, and the metamorphosis to womanhood was almost complete. She felt she could no longer pose in any way as a man, especially as she could no longer go to the loo standing up! 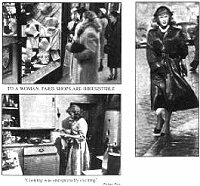 So she began at once to divest herself of all her male paraphernalia, as well as her auto engineering business (in which she had lost interest) and later, her fashion shop (where she leaned much about the clothing requirements for her womanhood and from where she initially obtained most of her classy outfits). A facelift was also planned for late 1951, which gave her a reshaped mouth with new thicker upper lip, and a smaller nose with just a hint of a tip! For a while her face was a mass of plasters, clips and stitching, but gradually as it was removed the new, pert Roberta was revealed. The day had finally come. Roberta had to appear in public in her finished femme state. 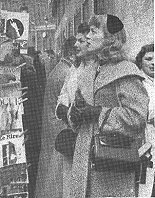 With some necessarily heavy make-up, a new hat and some pretty Dior ‘New Look’ style clothes, she set of into the outside world … starting at the deep end in West London’s top shopping streets. She was surprised that the only reaction to her was “wow” from some workmen! There was to be one small genital tidying up operation a few days later, but Robert had fully become Roberta! Dimensionally, she had changed too. Her bust was now 5 in. bigger, and her hips 2in. ; but her waist was 5in. smaller! And she had lost an inch or so in height. A good thing, because, having been a rather small fellow, Roberta was now quite a tall woman for the 1950’s. She found a great fascination in trying out every new wonder beauty treatment, lotion and fashion. Although her voice did not change, she learnt to modulate it, heighten the pitch slightly, and delete the male overtones. She had to wear a wig for quite a time until her hair grew long enough to give the hairdressers a chance to do something with it. Lisa remained her staunchest friend, and the harshest critic of the male mannerisms that occasionally manifested themselves. It took Roberta, as she had been warned, quite a time to get familiar with her new body, and her new existence. But she became contented with her lot and even found that some strong maternal instinct became apparent. Over the following years she faded into gentile obscurity. Her story will have echoes for those who have any form of gender dysphoria, and especially for all transsexuals. Many will be envious of the ease with which her birth certificate change was allowed at the time, which state of comparative legal bliss continued until the notorious Rowallen/Ashley case stopped such amendments. Three years later, Roberta wrote her autobiography, which was picked up by the Hulton Press’s Picture Post (a forerunner of today’s ‘OK’ or ‘Hello’), and serialised over several sensational issues. Her book is available still in some libraries (Roberta Cowell’s Story, W.Heinemann Ltd). Obituary – In 2013 The UK Newspaper, The Independent published her Obituary. Two years ago, a 93-year-old woman died alone. She was found lying on the bedroom floor of her sheltered-housing accommodation in west London. The flat was so cluttered that the wardens struggled to remove her body. Half-a-dozen people attended the cremation, and news of her death did not spread beyond Twickenham. This is not how Roberta Cowell should be remembered. Yet, in a way, it was the ending she chose, after leading one of the most extraordinary lives of the 20th century. Before withdrawing from the world, she had been a racing driver, a Spitfire pilot and a prisoner of war. She had also been a man. “Betty” Cowell was the first known person in Britain, and among the first in the world, to undergo pioneering gender-reassignment surgery, in 1948, before more famous cases such as April Ashley and Christine Jorgensen. 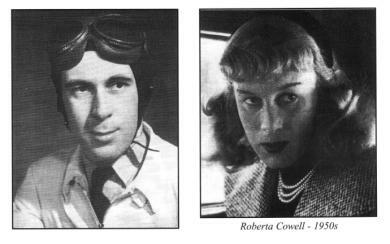 Before the war, as Bob, she (Cowell herself joked in her autobiography that one of the trickiest parts of undergoing gender reassignment was knowing which pronoun to use) had been a racing driver, competing at Brooklands in Surrey and in the Belgian Grand Prix. Later, Cowell became a fighter pilot, flying Tiger Moths and Spitfires. When her plane was shot down, she was captured and interned in Stalag Luft I. We will return to her heroic achievements in a moment. But first, the present. This is the first time Roberta Cowell’s death has been reported in any newspaper. So complete was her withdrawal from public life that even her own children did not know she had died, until contacted by The Independent on Sunday. The fact that Roberta’s death went unremarked upon for two years –she died on 11 October 2011 – is in itself remarkable in an age of global communication. We tracked down Bob’s two daughters, who last saw their father in 1948, the year he separated from their mother to undergo gender reassignment. Anne was six, Diana four. They have clear memories of waving their father off on the side of a race circuit. They would never hear from him again. Their mother remarried and had three more children, and Anne and Diana were brought up by their grandparents. Cowell’s father paid for them to be sent to boarding school, and Roberta cut off all contact. Even years later, she would ignore all approaches. This was a source of great pain to her daughters. Now 71 and 69, they were shocked to learn of their father’s death. “I have never sobbed like that,” says Diana when we meet. “I didn’t realise that pain was still there. What our father did has always had a great bearing on my life. The way I used to cope was by flying into fantasy.” Anne, her elder sister, took a more detached approach. “I felt that if someone hurt me in life, I didn’t want to have anything to do with them,” she says. “It was easier to shut them out. Roberta Cowell’s Obiturary from the Independent.